Sulphur’s bright yellow colour is reminiscent of the light and heat of the sun, and represents the sun in the alchemical process. In the Biblical reference to fire and brimstone, “brimstone” is the archaic word for sulphur – its fire burns off that which is not needed. It can be used to clear negative energy in the home, simply by placing it in a room, and it can help cleanse and eliminate negative thoughts and unhealthy behaviour patterns. Placed directly on the Solar Plexus, it releases anger and encourages us to express it in a constructive manner. Concurrently, its connection with the Solar Plexus makes it stimulating, mood-lifting and inspiring, leaving us feeling lighter, energised and joyful, and bringing in new ideas and creativity. Native sulphur is extremely toxic to many bacteria and fungi, and some practitioners use its vibration to treat infections, especially of the skin. In the first phase of the alchemical process, sulphur and mercury are added to the vessel, in order to burn off the lead, leaving nothing but ash (Negredo) – the destruction that precedes creation. Sulphur is estimated to be the ninth most abundant element in the universe, and is the third most abundant constituent in minerals (specifically in sulphides and sulphates) after oxygen and silicon. 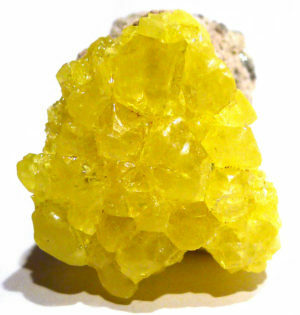 Well-crystallised sulphur is a sublimate of volcanic gases, and forms as encrustations around volcanic vents and fumaroles. Massive sulphur is found in beds, layered in sedimentary rocks. Sulphur compounds are very important in industry, primarily in the form of sulphuric acid, and used in fertilizer, insecticide, detergents, dyes, pigments, drugs, skin treatments, solvents, and in the production of rubber and rayon. The name is Middle English, introduced around 1390, or possibly earlier. Theophrastus (around 300 BC) wrote of μαλώδης (an otherwise unknown word) for what may have been sulphur-impregnated pumice, but Caley and Richards (1956) in their analysis and translation of Περι Λιθον, Peri Lithon, suggest that the actual word should have been μηλώδης meaning “quince-yellow”. Other interpretations have been given. Brimstone was an early name for sulphur, short for “burning stone”, and is referred to in the Book of Genesis. Sulphur ointment is mentioned in the Ebers Papyrus (1500 BC) for treating granular eyelids. Homer’s Odyssey alludes to its use in fumigation. Pliny the Elder describes its use in fumigation, medicine, and the preparation of fabric dyes. Sulphur was used in early traditional Chinese medicine, and the Chinese also discovered black gunpowder in the 11th century, which is a combination of sulphur and potassium nitrate. Sulphur was used in both Indian and early European alchemy; in Europe it symbolised the sun and the Masculine Principle, and together with Mercury, began the alchemical process. Until the advent of modern medicine, sulphur was traditionally used to treat skin complaints such as ringworm, psoriasis, eczema and acne. The mechanism isn’t completely understood, but it is likely that the mixture of sulphur and moisture from the skin and surrounding air would produce mild sulphuric acid, which acted as a reducing and antibacterial agent.